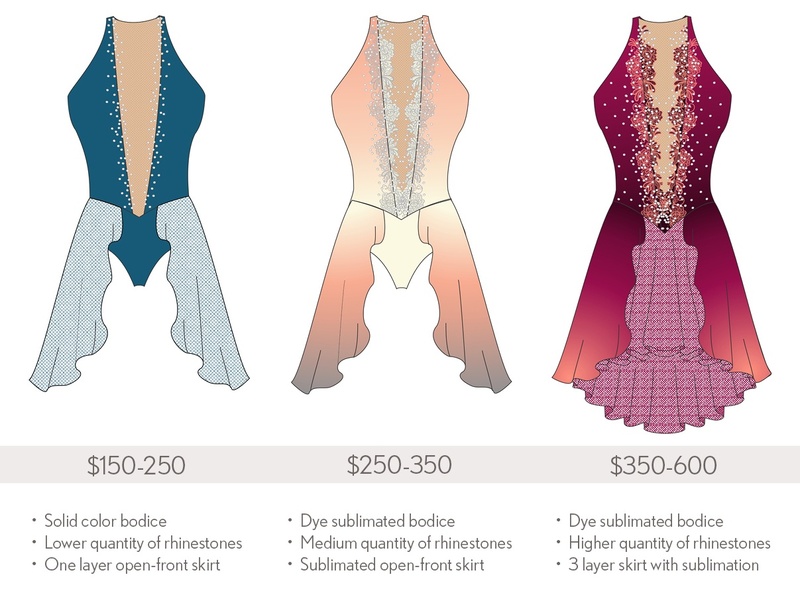 How Much Does a Custom Dance Costume Cost? One of the most common questions we get regarding costumes is "how much does a custom costume cost?!" This can be a difficult question to answer because a custom costume is just that - custom - and depends on what you add! Everything is completely unique, which means that the pricing is unique as well. As a general guideline, custom costumes can range anywhere from $150 to $600. The more detail and complex, the higher the price. However, we generally tell people the average price of a custom dance costume is around $250, and to start with that budget in mind. 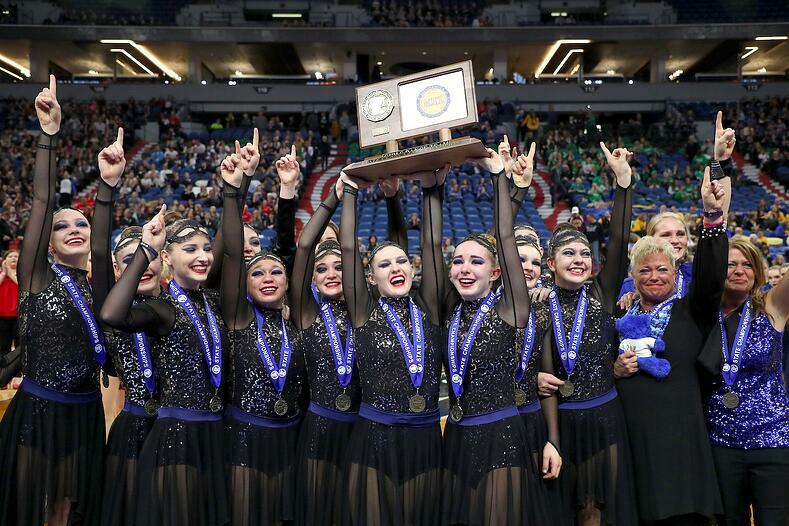 These are any labor fees that are associated with creating the technical pattern and design for your custom dance costume. The more complex your design is, the higher the fees will be, because they are based on an hourly labor rate. They can range anywhere from $50 to $125 depending on how long it takes to create a pattern. Know that for some companies these are one-time fees paid up-front, and sometime the fees are divided and included in the individual garment’s price – so it’s important to verify that with your chosen costume company! Looking to save money in this area? Consider using the base pattern of a garment that has already been created by your costume company. You'll avoid most of the patterning fees if the pattern has already been created! There are a variety of fabric options available from stock to special order. Using stock fabrics will be cheaper than choosing a custom fabric, because you'll avoid mark-ups associated with special ordering new fabrics. Novelty fabrics, like sequin encrusted Zsa Zsa will also be more expensive than your basic solid color stretch fabrics. Note that switching fabrics can also result in a patterning fee change. This is because different fabrics have different stretch properties which affect the fit, and the pattern of the garment may need to be adjusted to accommodate the fabric's stretch. Looking to save money in this area? Stick with your costume company's stock fabrics - which don't have to be boring! Going along with the complexity of your custom design, the number of pieces or components to your garment will add cost as well. For example, adding sleeves, multiple skirts, trim, blocking and insets will all add to the cost of your garment. Think of it this way: the more detail (like trim) and fabric coverage (like sleeves and skirts), the more your costume will cost. Looking to save money in this area? Consider modern and minimal designs with strong style lines! Think modern and minimal! Pairing the more complex Warrior Vest with a simple bra top and brief will cost less than pairing it full body unitard. Group discounts are available with most costume companies. The more garments you order, the higher the group discount! This is because making numerous costumes is easier than making just a few - the cost of patterning and labor gets lower as it is distributed among more costumes. Be to sure to ask your costume company about their group discount policies - you could save as much as 20%! 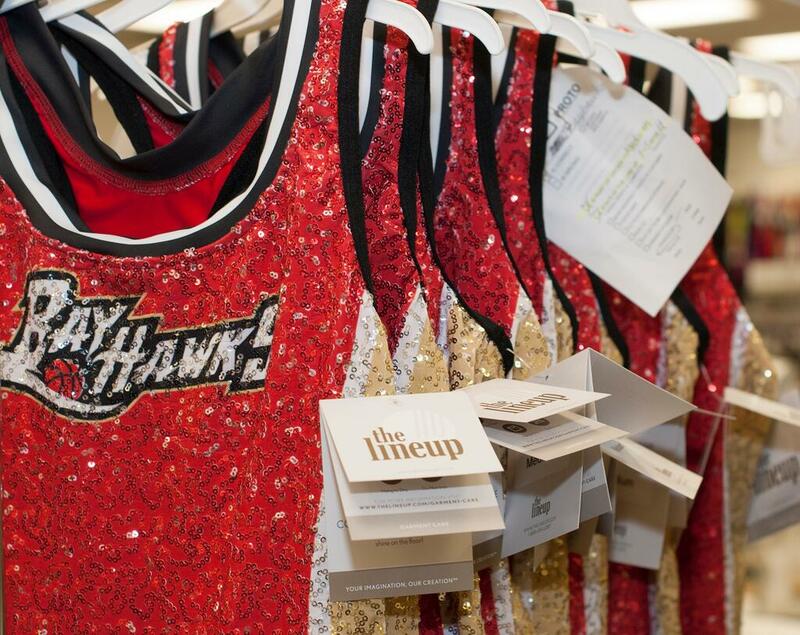 Rhinestones, appliques, logos and lettering are all popular add-ons to dance costumes! However, they can add cost. Things that affect the cost of embellishments include the material and labor cost to apply them, as well as the artwork fees to create them. Like construction elements, the more detailed and complicated your embellishment design, the higher the cost. Looking to save money in this area? Consider doing it yourself! Rhinestoning a costume yourself will save a lot in labor costs! The Jupela Leo (left) costs about $80 dollars less without the embellishments seen on the Jupela Leo Applique (right). Sometimes your design illustration or sample garment may not turn out as you envisioned, which is ok! Just know that changing the design in the middle of the design process will affect your budget and timeframe. A redesign means you will be starting over with illustrations and sample garments, requiring additional design costs and a delay in your ship date. To keep your costume on track and within budget, be sure to solidify your team's concept and choreography before starting the design process! Start by browsing your costume company’s existing, online styles to see what you like! You can make minor modifications (like color and fabric choices) to make it your own! Some companies even let you create your own custom look online by changing out the colors, without additional fees. Little or no modifications will save you in patterning fees and sample garment costs. With a mid-range budget, you can either start with an existing style you see and make modifications, or design from scratch! You have a little more wiggle room for things like rhinestones, embellishments, logos and lettering, and sublimated designs. Keep an eye out for things that have a lot of construction detail (trim, blocking, more coverage, etc) as those may cause the design to go over your budget. Sky's the limit! You're able to create a custom design from scratch. Be sure to provide your designer with a clear direction and vision in the form of a sketch or a detailed list of wants and needs. Because you are looking for a unique look (and the possibilities are endless! ), this will help keep your designer focused on your specific vision! Let's take a look at this in action. Above is an example of the same costume styled three different ways to meet three different budgets, yet all have a very similar look! As you can see, the cost of a custom dance costume can vary based on the complexity and amount of customization. Essentially, the more complex your garment is to make – meaning the more components and accents there are – the higher the cost will be! Your costume company should be able to steer you in the right direction to meet your budget, but keep in mind it's best to come in with a clear direction and idea of what you’re looking for. 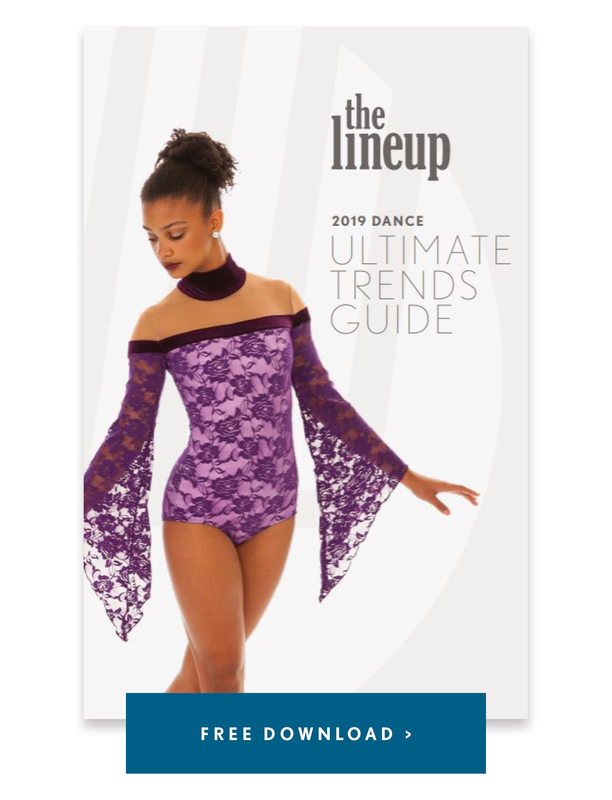 For more information on getting started with a design, check out our How to Design a Custom Dance Costume blog series!